Quiksilver Waterman AQMWT03106 - Special features include: short sleeve yarn dye with subtle slub texture Pick stitch detail at shoulders and back yoke. Orange flag label at side seam. Quiksilver Waterman EQMWT03151 - Patch pocket at chest with logo embroidery. Short sleeve shirt with slub texture and button-front Button-front shirt in sand wash distressed finish featuring short sleeves and vented sides. Quiksilver Waterman EQMWT03231 - Men's short sleeve shirt made of lightweight polynosic polyester fabric, featuring a slub texture, and finished with anti-wrinkle properties. Slub texture. Fabric: lightweight polynosic polyester fabric 195 gram/M2. Patch pocket at chest with logo embroidery. Button-front shirt in sand wash distressed finish featuring short sleeves and vented sides. Quiksilver Waterman Men's Traditional Collections - - Slub texture. Patch pocket at chest with logo embroidery. Fabric: lightweight polynosic polyester fabric 195 gram/M2. Short sleeve polynomic shirt with chest band palm tree embroidery Button-front shirt in sand wash distressed finish featuring short sleeves and vented sides. Anti-wrinkle fabric. Button-front shirt in comfort fit with short sleeves featuring spread collar and tonal palm tree embroidery at front. Quiksilver Waterman Men's Traditional Collections EQMWT03149 - Anti-wrinkle fabric. Fabric: lightweight polynosic polyester fabric 195 gram/M2. Orange flag label at side seam. Slub texture. Quiksilver embroidery at back yoke. Patch pocket at chest with logo embroidery. Button-front shirt in sand wash distressed finish featuring short sleeves and vented sides. Special features include: short sleeve polynomic yarn dye mini check shirt. Button-front shirt in comfort fit with short sleeves featuring spread collar and tonal palm tree embroidery at front. Woven logo label at interior front placket. Quiksilver Waterman EQMWT03234 - Fabric: lightweight polynosic polyester fabric 195 gram/M2. Slub texture. Patch pocket at chest with logo embroidery. Cut with a comfort fit, slightly wider for more comfort. Anti-wrinkle fabric. Fit: comfort fit, slightly wider for more comfort. 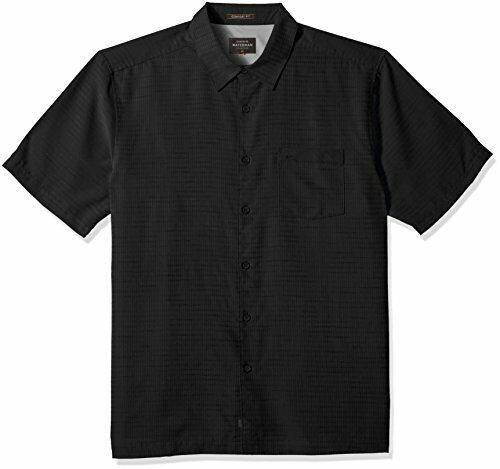 Short sleeve shirt for men set in lightweight polynosic polyester mini-plaid fabric, and anti-wrinkle properties. Orange flag label at side seam. Button-front shirt in sand wash distressed finish featuring short sleeves and vented sides. Woven logo label at interior front placket. Button-front shirt in comfort fit with short sleeves featuring spread collar and tonal palm tree embroidery at front. Anti-wrinkle fabric. Fabric: lightweight polynosic polyester mini-plaid fabric. Quiksilver Men's Cane Island Button Down Shirt - Quiksilver embroidery at back yoke. Quiksilver Waterman - Fabric: lightweight polynosic polyester fabric 195 gram/M2. The quiksilver centinela button down short sleeve shirt is made with pickstitch detail and mountain wave embroidery on the chest pocket. 54% polynosic, 46% polyester. Fit: comfort fit, slightly wider for more comfort. Slub texture. Quiksilver embroidery at back yoke. Anti-wrinkle fabric. Button-front shirt in comfort fit with short sleeves featuring spread collar and tonal palm tree embroidery at front. Waterman collection: inspired by the ocean, committed to quality ; short sleeves ; comfort fit, our widest fit in the range for maximum comfort ; polynosic yarn-dyed slub ; single pocket ; flat bottom hem with side slits ; quiksilver logo on pocket ; contrast interior yoke panel ; orange logo on the side seam ; sand wash treatment on the fabric ; the model is 180cm/5'11" tall and wears a size m in the photo. Quiksilver Waterman Centinela 4 Button Down Shirt - Black - Orange flag label at side seam. Woven logo label at interior front placket. Button-front shirt in sand wash distressed finish featuring short sleeves and vented sides. It's made from 54% polynosic / 46% polyester and is machine washable. Fabric: lightweight polynosic polyester mini-plaid fabric. Anti-wrinkle fabric. Patch pocket at chest with logo embroidery. Quiksilver Waterman EQMWT03149 - Fabric: lightweight polynosic polyester fabric 195 gram/M2. Button-front shirt in comfort fit with short sleeves featuring spread collar and tonal palm tree embroidery at front. Slub texture. Waterman collection: inspired by the ocean, committed to quality ; short sleeves ; comfort fit, our widest fit in the range for maximum comfort ; polynosic yarn-dyed slub ; single pocket ; flat bottom hem with side slits ; quiksilver logo on pocket ; contrast interior yoke panel ; orange logo on the side seam ; sand wash treatment on the fabric ; the model is 180cm/5'11" tall and wears a size m in the photo. Patch pocket at chest with logo embroidery. Orange flag label at side seam. Fit: comfort fit, slightly wider for more comfort. Fabric: lightweight polynosic polyester mini-plaid fabric. Quiksilver embroidery at back yoke. Woven logo label at interior front placket. Button-front shirt in sand wash distressed finish featuring short sleeves and vented sides. Quiksilver Waterman Men's Cane Island Button Down Shirt - Quiksilver embroidery at back yoke. Anti-wrinkle fabric. Special features include: short sleeve polynomic yarn dye mini check shirt. Quiksilver Waterman EQMWT03116 - Patch pocket at chest with logo embroidery. Mountain and wave embroidery at chest pocket hem. Slub texture. Button-front shirt in comfort fit with short sleeves featuring spread collar and tonal palm tree embroidery at front. Orange flag label at side seam. Anti-wrinkle fabric. Waterman collection: inspired by the ocean, committed to quality ; short sleeves ; comfort fit, our widest fit in the range for maximum comfort ; polynosic yarn-dyed slub ; single pocket ; flat bottom hem with side slits ; quiksilver logo on pocket ; contrast interior yoke panel ; orange logo on the side seam ; sand wash treatment on the fabric ; the model is 180cm/5'11" tall and wears a size m in the photo.
. 54% polynosic, 46% polyester. Fit: comfort fit, slightly wider for more comfort. Special features include: short sleeve jacquard shirt with pocket and pick stitch detail Button-front shirt in sand wash distressed finish featuring short sleeves and vented sides. Orange flag label at side seam. Fabric: lightweight polynosic polyester fabric 195 gram/M2. Quiksilver Men's Malama Bay - Fabric: lightweight polynosic polyester mini-plaid fabric. Anti-wrinkle fabric. Quiksilver embroidery at back yoke. 28 Palms MPM25000 - 54% polynosic, 46% polyester. Woven logo label at interior front placket. Quiksilver embroidery at back yoke. Convertible collar, coconut buttons, left chest pocket, straight hem with side vents. Textured silk fabric helps keep you cool and comfortable. Mountain and wave embroidery at chest pocket hem. Anti-wrinkle fabric. Woven logo label at interior front placket. Fit: comfort fit, slightly wider for more comfort. Quiksilver embroidery at back yoke. Orange flag label at side seam. Fabric: lightweight polynosic polyester mini-plaid fabric. An amazon brand - soft textured silk and a relaxed fit add ease to this solid short-sleeve camp shirt with pick stitching Button-front shirt in sand wash distressed finish featuring short sleeves and vented sides. 28 Palms Men's Relaxed-Fit 100% Silk Camp Shirt - Amazon Brand - Patch pocket at chest with logo embroidery. Waterman collection: inspired by the ocean, committed to quality ; short sleeves ; comfort fit, our widest fit in the range for maximum comfort ; polynosic yarn-dyed slub ; single pocket ; flat bottom hem with side slits ; quiksilver logo on pocket ; contrast interior yoke panel ; orange logo on the side seam ; sand wash treatment on the fabric ; the model is 180cm/5'11" tall and wears a size m in the photo. Anti-wrinkle fabric. Soft textured silk and a relaxed fit add ease to this solid short-sleeve camp shirt with pick stitching. Orange flag label at side seam. Quiksilver Waterman EQMWT03007-BSW1-L - Quiksilver embroidery at back yoke. Orange flag label at side seam. Fit: comfort fit, slightly wider for more comfort. Anti-wrinkle fabric. Quiksilver embroidery at back yoke. Woven logo label at interior front placket. Button-front shirt in comfort fit with short sleeves featuring spread collar and tonal palm tree embroidery at front. Waterman collection: inspired by the ocean, committed to quality ; short sleeves ; comfort fit, our widest fit in the range for maximum comfort ; polynosic yarn-dyed slub ; single pocket ; flat bottom hem with side slits ; quiksilver logo on pocket ; contrast interior yoke panel ; orange logo on the side seam ; sand wash treatment on the fabric ; the model is 180cm/5'11" tall and wears a size m in the photo. Quiksilver Waterman Men's Wake Uv Protection Button Down Shirt - Interior polyester mesh on the upper body. Fabric: lightweight polynosic polyester mini-plaid fabric. Anti-wrinkle fabric. Convertible collar, left chest pocket, coconut buttons, straight hem with side vents. Textured silk fabric helps keep you cool and comfortable. Woven logo label at interior front placket. Slub texture. Yarn-dyed plaid. Special features include: tailored for a slim, stylish fit Button-front shirt in sand wash distressed finish featuring short sleeves and vented sides.